A couple of posts back I mentioned that I’d got my storyline to the point where I’d started working on the timeline. As it turns out, I got a little bit ahead of myself. I’ve had to stop working on the timeline because I realised I’d made a mistake with the story. And boy, is it a doozy. The way I had the story set up, the first of the four stories starts with my protagonist having a problem. And the way the story went, that problem had been worked out by the end of that same first story. That doesn’t work; it would mean she’d need a new problem to take into the second story. And if she’d already dealt with the biggest obstacle in her life, then what possible hurdles could she have in the second story that would even come close to that? Here’s a couple of examples of the kind of thing I’m talking about; this should make it clearer. First, look at Harry Potter. His problem is Voldemort. And while he wins fights against The Dark Lord in each book, Harry doesn’t actually beat him for good until the final battle at the end of the last book. Another example: Neo’s fighting the machines and we find that out early in The Matrix, but he doesn’t end the war until the end of the third and last movie. Last example: Frodo encounters the One Ring not far into The Fellowship of the Ring, and the story only ends when he destroys the ring—and Sauron—at the end of The Return of the King. You get the picture. I’ve had to go back to my plotting and change things so that the problem my protagonist has at the beginning of the first book carries her through a series of adventures all the way through the complete set of four stories. And that in turn has meant adding in a bucketload of back story to support things—and the rabbit hole gets deeper as she learns more about the truth behind her original troubles a little at a time; she only finds out the complete details close to the end of the last story. It also means that what was to be the second story in the series will be pretty much torn down and replaced, and the way things are going it’s not impossible that I’ll need a fifth book to complete the whole tale. So at the moment timelining is suspended until I get all the details worked out and written down. What I thought was going to take a few days is now looking like it’s going to take a few weeks at least. This thing is becoming a monster. I’ll post more on this as I progress. Read and inwardly digest, gentle reader. I found out that the Finish Your Book file I uploaded to Smashwords didn’t get converted properly (my bad—I messed up a paragraph style). As a result the text ended up with first-line indents on every paragraph instead of the block paragraphs I wanted. The problem is fixed; I uploaded a new file with the corrected formatting. If you bought the book on Smashwords you can download again (you already paid for it, so no need to buy it again). The way I understand it, if you got it on a Nook, Kindle, or Kobo, your device copy will update automatically within a few days. If it doesn’t, I believe you can remove it from the device then re-download it and you should get the updated version. Now, I need to go and update the links on the Books page to add the B&N link. Thanks to all who’ve bought and downloaded the book. I hope you enjoy it and it helps with your writing! IF you’ve been following updates on my Work-in-Progress (WiP) page, you’ll know that I’ve been working on a short non-fiction book about my writing process while I’m (1) waiting on markups for The Artemis Device from my copy editor, and (2) waiting on responses from agents for the query letters I sent out for Smoke & Mirrors. The first could appear at any time; the second I don’t expect for at least another couple of weeks. So in the interim, and before I get properly to work on the SF novel I’ve been thinking about, I decided to do something I’ve been wanting to do for a while—document my writing process. And thanks to the writing workshop I’ve been going to the last few weeks, I also decided to write it up in a form that I can self-publish, in the hope that maybe I can do something that will help other aspiring writers. By short I mean that the main body will probably end up being around thirty pages; my writing process, boiled down to just the essentials. The stuff I wish I’d known when I was just getting started, in a form that someone can read in an hour or less and keep handy as a reference after. I started with a series of about half a dozen blog posts I wrote here a while ago; I’ve cleaned those up, expanded on them with some better examples and some additional material, and changed the order of things around a little bit to make it a bit more logical. It’s just about done; the main text is complete, I think—I’ll be checking it through again to see if I missed anything. It needs a few things yet: a cover page, a proper title, and some front and back matter. And I have to re-read the Smashwords guides to remind myself how to format it all up. But I expect to have that all done in a couple more weeks at the most, and then it’ll be out (and of course I’ll announce it here when that happens). On that note, time for coffee and a read of that Smashwords formatting guide. Until next time . . .
YOU’VE self-edited your script, and now it’s much better than that first draft you had before. Is it perfect? Probably not. You could do another editing pass and I’ll bet you’ll still find something wrong. Lots of somethings, in fact. But there comes a point where you can honestly say to yourself that your typescript is something you’re happy for someone else to read. Are you ready to get it published? How do you get it published? Self-publishing. There are plenty of places to do that. My very first full-length work was self-published on Smashwords, and as part of that process it was automatically made available on Amazon, Barnes & Noble, Kobo, and several other platforms. But to self-publish properly, you have to do all the work that a publisher would do. You must BECOME THE PUBLISHER. You need, really need, a professional editor to work with you on polishing the work to a high shine. (I can’t stress how important that is. Some people can self-edit to a professional standard, but those people are as rare as rocking-horse droppings; do you really, honestly think you can self-edit to that standard?) You need someone to format it properly for publication. You need cover artwork. Of course, you could do all that yourself, but you’re better off getting professionals involved—and that costs money. So you have to ask yourself, are you happy to spend the cash with no guarantee that you’ll make enough sales to get that money back? 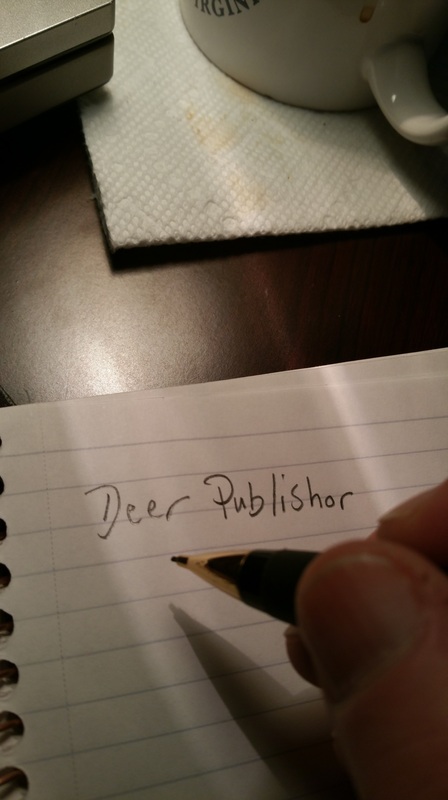 Go directly to a publisher. Smaller indie publishers will generally accept submissions directly from authors. Larger publishers, not so much (see the next bit, about agents). Work up a list of publishers that deal with books in your genre—you might be surprised just how many people submit work that’s in a genre the publisher just doesn’t deal with. Make sure they’re accepting submissions (many publishers only accept submissions at certain times of year; some only open for submissions when they have the bandwidth to take on work). Publishers have guidelines for submissions—for example they might ask for the first ten pages of your story to be pasted into an email cover letter. Some will ask for a synopsis. Many will delete emails with attachments unread. So read the guidelines carefully and follow them to the letter. Find an agent. The bad thing everyone thinks about agents: they take a percentage of the profits of sales of your book. Well, of course they do. They have to pay the rent on their double-wide, same as you. But the good things about agents outweigh the bad by a good margin. An agent can submit your book to publishers that won’t take submissions direct from authors. They can help make sure that a publishing contract isn’t screwing you. They can get you better contract terms (for example a better percentage on sales) than you might be able to manage on your own. In the end, the fact that agent takes, say, fifteen percent, is more than made up for by the fact that she’ll get you a publishing deal that makes you more sales. Some agents also suggest edits to improve the work. As to finding an agent . . . well, there are a few ways. Follow Writer’s Digest (@WritersDigest) on Twitter—they often send out alerts when agents are looking for books in specific genres. Check out QueryTracker—this is a great tool that can help you search for agents. When you find an agent to submit to, the rules are much the same as for publishers—check genre, make sure the agent is accepting submissions, follow submission guidelines closely. When it comes to writing query letters, check out Query Shark. This is IMPORTANT: No reputable agent or publisher should ever, ever, EVER ask you for money up front to “cover costs” or for anything else. Real publishers and agents take their percentage from sales of the book AFTER it’s been published. If an agent or publisher charges for their services up front, they’re almost certainly scam artists intent on taking your money. Take a look at the Writer Beware site for more on this. Here’s another thing: Be ready for rejection. In fact, expect rejection—that way it won’t faze you when it happens. And it will happen, over and over and over. At a rough estimate based on what I’ve seen, the chances of any one agent accepting your work is something like five percent. Indie publishers appear to have higher acceptance rates, but it’s hard to be certain about that because good data is hard to find. The thing is, agents and publishers are taking a risk when they accept your work. They have to cover the costs of doing their job until your book is on the shelves and making sales—in the case of agents, time spent dealing with publishers, and in the case of publishers, paying editors and artists and everyone else involved in getting your book out there. Maybe you’ll sell hundreds of thousands of copies and you’ll all be rolling in cash. Or not. It’s a gamble, and it’s on their dime, which is why agents and publishers are so picky about what they accept. Now let’s say your work is accepted. What next? AFTER you’ve celebrated a little bit (because getting accepted IS a big deal and worthy of a little celebration), be ready for what can be the hardest part of this whole thing. Remember all that self-editing you did? Well, now it’s about to happen again. Only this time, someone else—maybe your agent, maybe a copy editor working for a publisher—will be picking your book apart and finding things you didn’t even suspect weren’t right. They’ll be coming back at you with lists of things that need changing. (They should not be making those changes themselves, beyond maybe correcting simple, obvious stuff like spelling errors; they should just be telling you this passage or that scene needs fixing, and they might suggest ideas for how to fix it. But it’s your book, and how you fix it is up to you.) And you might very well find yourself working to a deadline. Here’s a story for you; at the time Mr. Gunn & Dr. Bohemia was accepted, I had no idea that I was about to spend the next SEVEN MONTHS editing the typescript for publication. Seven months of working on it evenings after work, and hour upon hour at weekends. It was tough, and not just on me—I swear my wife had plans to throw my laptop out into the yard and then set it on fire. (This is why so many books have an “acknowledgements” page where the author thanks their spouse for putting up with it all for so long. Until you’ve been through it, and put your other half through it, you have no idea just how much mutual understanding is needed for this.) But seeing the book out where people could buy it made it all worth it. And guess what? Once you’ve been through it once, the lessons you learn will make the next one go that much easier. That, I think, concludes this short series of posts (unless I think of something else to add). I hope, gentle reader, that this helps in some small way.